LIMITED TICKETS AVAILABLE AT THE DOOR TONIGHT, WHILE SUPPLIES LAST. Join saxophonist Marcus G. Miller and his band — Noah Jackson on bass, Eli Menezes on guitar, Bobby Sanabria on drums/percussion, and ELEW on piano — along with Princeton University professor and mathematician William A. Massey for an evening of music and mathematics, two fields that encourage creativity and exploration and build new languages out of natural information patterns. Dr. Massey, whose research interests include queueing theory and applied probability, will discuss and demonstrate the importance of mathematics as an information pattern language that is used to describe ideas in science, technology, engineering, and mathematics (STEM). Miller will create a musical dialogue using the rhythmic, harmonic, and melodic pattern languages of jazz, classical, and Latin music. 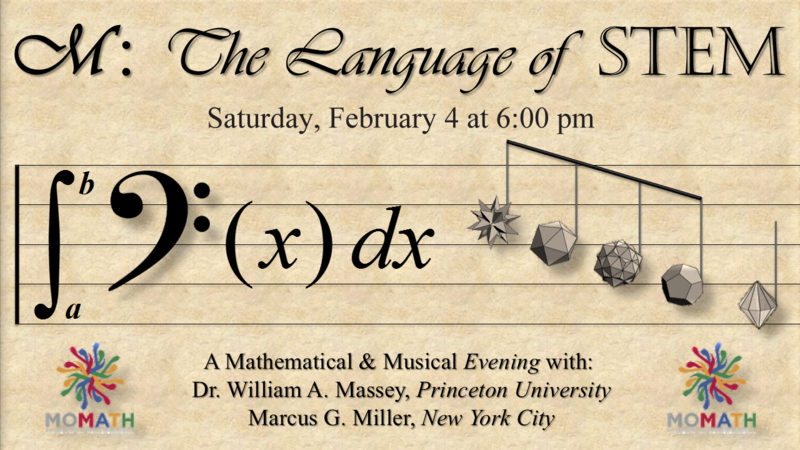 Don’t miss this exciting evening of math and music!